In which I become officially engrossed in this series. Shoot. There goes my free time. Warning: The following review is for the second book in a series. If you do not want to read spoilers, avert your eyes! Do not read on! Ye have been warned! What it’s about: When last we left it, the land of Westeros had at least three kings: Joffrey and the Lannisters rule in the capital of Kings Landing, the late King Robert’s youngest brother Renly has the force of the South behind him, and the lords of the North have declared young Robb Stark their rightful ruler. But other bids for the throne continue to pop up. By order of birth, Stannis Baratheon claims to be the rightful heir and he has harnessed the power of a foreign god, the Lord of Light, and the help of a red-garbed sorceress to secure his crown. The lord of the Iron Islands, whose son Theon was held hostage by Ned Stark after a previous uprising, now means to take northern Westeros while the Stark forces march on the South. And across the ocean, while men vie to call themselves king, Daenerys and her newborn dragons search for an ally who can help make her a queen. Though Martin maintains the device of alternating points of view (nine this time), it’s Tyrion Lannister who emerges as the central voice in this installment as he takes on the role of King’s Hand and navigates the intrigues of the court that only months earlier ended Ned Stark’s life. In my opinion, Tyrion is one of the most fascinatingly complex characters in this world. As a Lannister, we’re meant to root against his family. There’s little to like about his hateful, incestuous siblings or violent, repugnant nephew. And Tyrion is no saint. He upholds the Lannister name and acts in the best interest of the family at all times. And yet…we like Tyrion. Sometimes we love him! He’s clever and witty, but also just and even forgiving. He seems to develop a genuine relationship with his concubine, Shae, which is only held back by his troubled history with prostitutes. And he protects Sansa Stark from Joffrey’s cruelty, not only it seems to keep her intact as their hostage, but also because she is a child and a girl and alone. Sansa is continually searching for her “true knight,” but the irony is that if anyone in the castle treats her nobly, it’s the man who by necessity must also keep her prisoner. Book 2 also gives us two new POV characters: Theon Greyjoy and Davos, a smuggler-turned-knight and member of Stannis Baratheon’s fleet. Davos seems merely a pair of eyes to give us access to the action in Stannis’s court, but Theon emerges as a new villain we’ll have to suffer for a time. Ugh. I just think he’s the worst. He’s insufferable: swaggering, self-entitled, and overly impressed with himself. I hope Robb chops his head off. And speaking of which, one question I have is why we never see Robb’s POV? We had access to almost every other aspect of the action, but no eyes in Robb’s army. We hear about his success in battle secondhand and still know very little about him as a character. I’m hoping that Robb will be further developed in the next book. Arya continues to delight, Catelyn is heartbreaking but strong, Bran’s eyes are opened to the old magic, Daenerys searches for followers, and Jon comes into his own beyond the Wall. Would I recommend? Strongly. 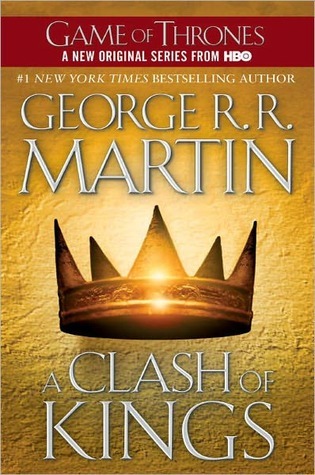 A Clash of Kings just served to further immerse me in the world of Westeros. I think I’m going to have to read A Storm of Swords next! Will you forgive me for two books from a series straight in a row? I’ve got other things on tap, but I’m just too engrossed in this now!